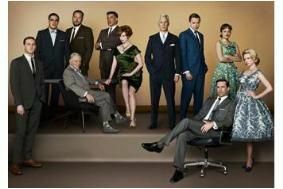 Sky snatches Mad Men series 5 from the BBC | What Hi-Fi? Mad Men series 4 is currently running on BBC Four and BBC HD, but this will be its last outing on the Beeb. Sky has secured a "life of series" deal for exclusive rights to Mad Men from the next series. The BAFTA award-winning programme made history as the only cable show to win back-to-back best drama Emmy Awards and is the only series to win the Golden Globe Award for best drama for three consecutive years. In a separate development, Sky Atlantic HD will also exclusively show HBO's forthcoming new series in the UK and Ireland, including Boardwalk Empire, the Prohibiition-era drama from Martin Scorsese, as well as fantasy drama Game of Thrones and Treme, which chronicles the rebuilding of new Orleans after the devastation of hurricane Katrina. Classic HBO series such as The Sopranos, The Wire and Six Feet Under will also move to Sky Atlantic HD. Sophie Turner Laing, Sky's managing director for entertainment, says: "Sky Atlantic HD will be an extraordinary TV channel. It will have compulsive television that pushes creative boundaries and tells great stories." She adds that Sky Atlantic HD will also offer a range of exclusive new UK programming as part of the satellite broadcaster's "growing commitment to original production". Further details to be announced in due course. Boardwalk Empire will begin on Atlantic HD from February 2011, while Game of Thrones and Treme both start in April 2011.